There were major delays to Metro and V/Line services on the Werribee/Geelong line on Tuesday night after a train hit a shopping trolley. 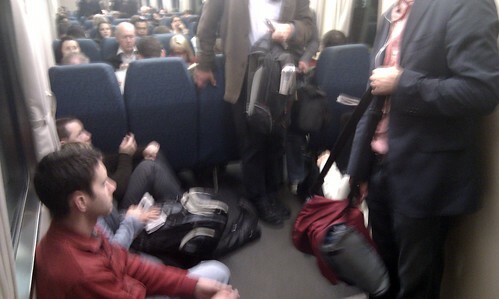 Some V/Line passengers were stuck on their train for several hours. Obviously the root cause of the problem was the thoughtless people who dumped the shopping trolley on the tracks, but a PTUA member on the V/Line train (who took this photo) said that communication to passengers was lacking, and that the train initially stopped at Hoppers Crossing station before continuing. Obviously if it had been known the train would be so severely delayed, the train could have been held there and the passengers let off. It does underscore that the way disruptions and incidents are handled needs to improve. PT Problem of the Day: Skybus overcrowded – if only we had an airport train! PT Problem of the Day: #Myki gate problems last week – due to a buggy software release?